Genuine "Made in the UK" Vox Brown Diamond Grill Cloth from the Late 1990's - As used on the AC-30TB, AC-30TBX, AC15TB and AC-15 TBX amps sold by Korg/Vox and manufactured under subcontract by Marshall Amplification PLC. This cloth was produced in the UK from 1994 to 2004.. The photos at left have been very carefully taken to highlight the differences between the current production of brown Vox grill (upper image) versus the UK produced cloth from the 1990's (lower image). The diamonds in the current production of Vox grill cloth are slightly taller and wider than the diamonds in the UK made Vox cloth. These larger sized diamonds are actually more accurate to the size of the diamonds found on 1960s era JMI and Thomas Vox fret cloth. The British made fabric has a finer weave pattern and tends to be a little more tan than the current reissue cloth. The current reissue cloth has a deeper brown tone. 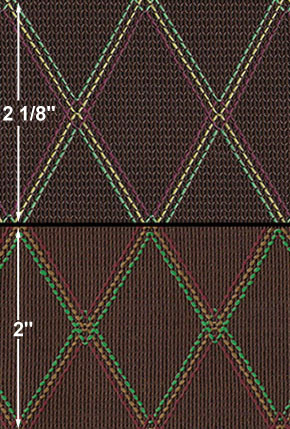 The British cloth has red, green and gold diamond stitching, the current cloth has green, red and a lighter gold stitching. All we have left in stock are AC-30 head sized pieces. NCM-360UK - Piece of brown "made in the UK" Vox grill sized 11" tall x 29" wide. Ideal for AC-30, AC-50, or AC-100 HEAD cabinets. This product is new old stock VOX production fretcloth from the late 1990's and while similar in appearance and style, it does NOT exactly match ANY previously produced VOX fretcloth. ** NOTE ** This item is is non-returnable, non-refundable and non-exchangable. Please make your selection carefully.